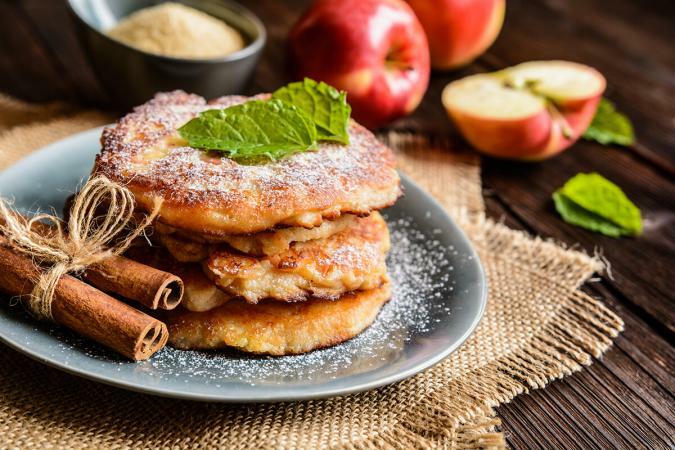 With a bit of care, it is easy to make homemade fritters that are a rich and decadent treat, suitable for breakfast, dinner, dessert, or just as a snack. 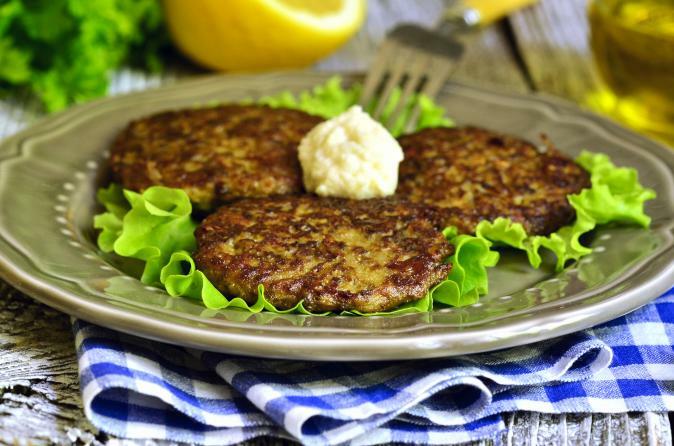 There are a wide variety of fritter recipes to try that are sure to please just about anyone. Before you start making fritters, find the right batter that works for your kitchen and taste buds. Try this basic batter recipe that uses light tasting coconut oil for a refreshing flavor. Mix in your choice of different fillings, from sweet and fruity to meat and savory. Break the egg into a small mixing bowl and beat with a wire whisk until light and foamy. Add the milk and the coconut oil and beat well. Mix in the remaining ingredients and stir until the batter is well combined and smooth. 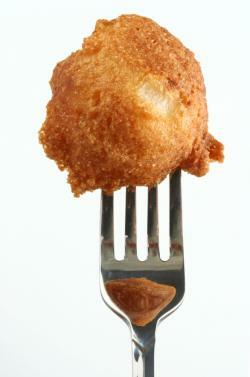 Add one cup diced fruit, vegetable or meat to the batter and drop from a tablespoon into hot oil for deep frying. Fruit makes one of the most common fillings for fritters. Dust powdered sugar on any of these sweet-tasting treats for a simple, yet delicious dessert. Peel, core, and cut each apple into eight slices. In a medium-size bowl, sift all the dry ingredients together except for the powdered sugar. In a small bowl, beat the egg well and add the milk to it. Stir the wet ingredients into the flour mixture until well mixed. Preheat deep fryer oil to 375 degrees F.
Dip the apple slices into the batter to coat. Fry each batter-covered slice in hot oil until golden brown. Drain fritters on paper towels, sprinkle with powdered sugar, and serve warm. Mix the flour, baking powder, and salt together in a medium bowl. Beat in egg, margarine, and milk until batter is smooth. Peel the bananas and cut into smaller pieces (about 2 inches in length). Heat oil in a large skillet to 375 degrees Fahrenheit. Dip bananas into the batter with a long spoon or fork, and gently lower into the hot vegetable oil. Fry the bananas until golden brown. Remove from the oil with a slotted spoon and drain extra grease on paper towels. 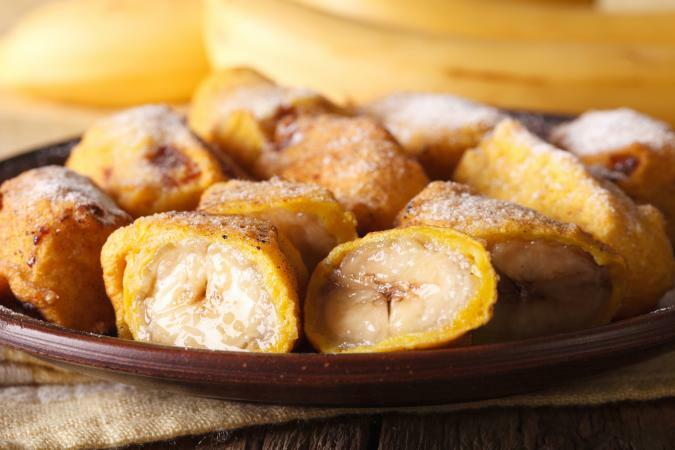 Cut banana pieces in half, dust with powdered sugar, and enjoy! Fritters can be savory as well as sweet. These fritters use a variety of different vegetables to form their base. Broccoli and cauliflower should be divided into florets. Large florets should then be cut into smaller, bite-size pieces. Potatoes and root vegetables such as carrots or parsnips should be grated. Tomatoes and squash work best when they are sliced and then dipped into the batter. Combine the dry ingredients and seasonings in a medium mixing bowl. Beat egg and milk until golden-yellow and foamy, and then stir the mixture into the dry ingredients to make a smooth, thick batter. Heat cooking oil in a deep fryer to 375 degrees F.
Dip bite-size pieces of vegetables like broccoli or sliced vegetables in the batter and lay on waxed paper until ready to fry. Using tongs, drop several pieces into the deep fryer, taking care not to overcrowd them. Cook fritters about 4 minutes or until golden brown and repeat the process for remaining pieces. Drain the fritters on paper towels and serve hot. Preheat frying pan and shortening over medium-high heat. Fold the grated vegetables into the prepared batter. Drop spoonfuls of batter onto hot frying pan. When bottoms turn golden brown, flip and brown the other sides. Heat oil to 375 degrees F on the stovetop in a large pan. Sift flour, baking powder, salt and paprika into a bowl. Add corn, celery, and egg yolks. Working in batches, drop batter by spoonfuls into oil and allow to fry until fritters are golden brown. Allow oil to return to 375 degrees between batches. Drain fritters on a paper towel. Fritters can be eaten as a meal, as well as a dessert or side dish. Just like crab fritters or cakes, these meat and cheese-based fritters can stand on their own as a main dish. 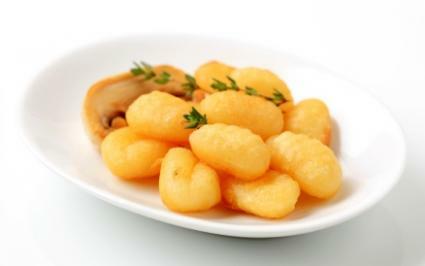 In a medium-size bowl, stir the flour into the water until there are no lumps, and then stir in the melted butter. Whisk the whites of 2 eggs until foamy and then fold them and the beef into the batter until combined well. Preheat a frying pan over medium-high heat and melt the shortening in it. Drop only small, rounded quantities of batter at a time into the pan. Fry fritters until brown on bottom and then flip them. Flatten slightly and continue frying until browned on the opposite side. Put all ingredients except the cheese in a large mixing bowl and mix well. Batter should be thick but not stiff or difficult to stir. Fold in the cheese. Add oil to a deep fryer and heat to 375 degrees F.
Drop the fritter batter from a spoon into the hot oil, using about 1 rounded tablespoonful per fritter. Fry about 3 to 4 minutes, or until the fritters are golden brown and thoroughly cooked. Serve hot with mustard dip on the side. Fritters can be endlessly changed and varied according to your tastes. Try a variation or substitution to create your own unique recipe. Substitute vanilla almond milk for dairy in any fruit-based recipe for a sweeter taste. Add just a pinch of sugar to any savory fritter to enhance the flavor. Add some cumin and turmeric to the beef fritters for a Middle Eastern-style taste. Mix cubed potatoes into the clam fritters for a more complex taste and texture. 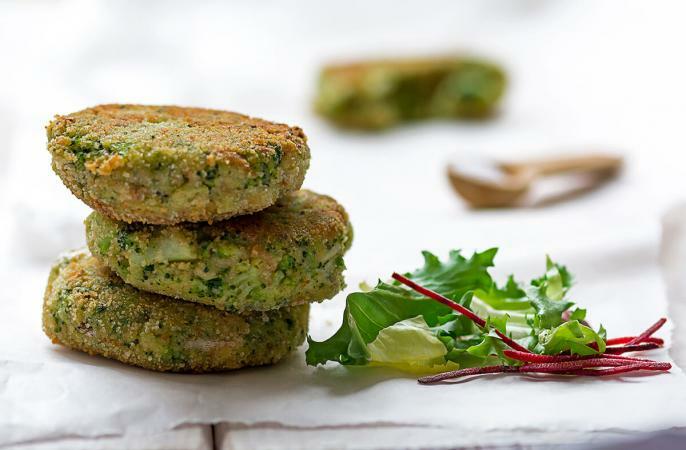 Shred your vegetables in a food processor before adding them to the vegetable fritter to extract more flavor. 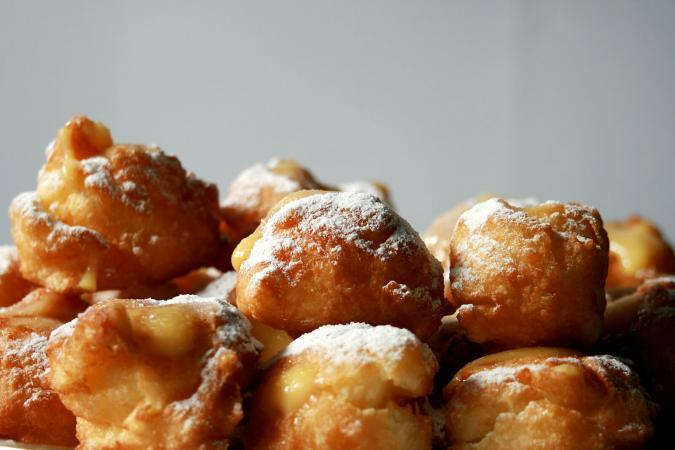 Ideally, the taste of the fruit or other filling should be the dominate flavor of the fritter, rather than the taste of the batter. Fritters require deep frying, so they should be thoroughly drained before serving to avoid a dish that is too greasy and unappetizing. If the food inside is uncooked, the oil may have been too hot or the coating too thick. If the coating is too thin or uneven, the food may be overcooked or the batter could float off the bits of food. To properly adhere the coating, the fruit or other type of food should be dry before dipping. Fritters don't have to be confined to a set number of ingredients or spices. Try enhancing any of these fritter recipes with your own variations on filling, spices, or accompaniments. With just a bit of experimentation, you're sure to come up with your own winning recipes.